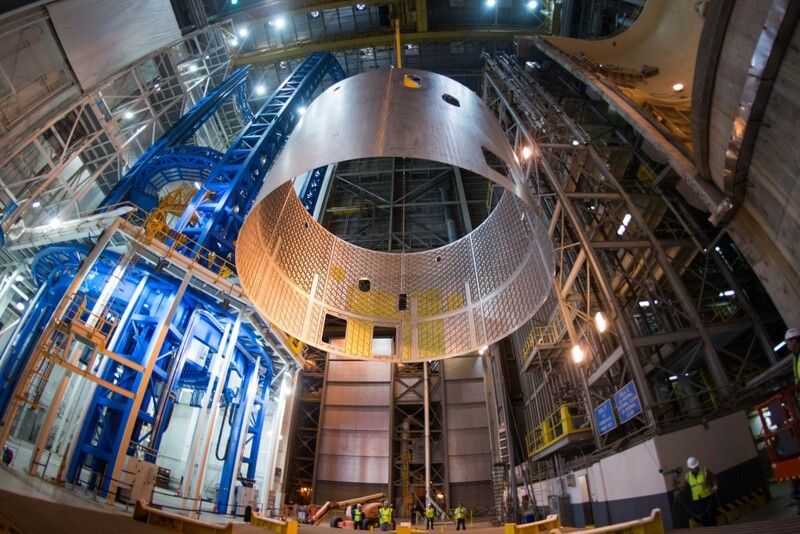 February 25, 2016 – This will be a pinnacle year for NASA’s Michoud Assembly Facility in New Orleans, as all welding for the structural backbone of NASA’s new rocket, the Space Launch System, will be completed this summer in preparation for its first flight in 2018. NASA’s first uncrewed test flight with Orion atop SLS is critical to paving the way for future flights with astronauts to deep space, including on a journey to Mars. The structural backbone of SLS is the core stage, which will tower more than 200 feet tall and store cryogenic liquid hydrogen and liquid oxygen that will feed the vehicle’s four RS-25 engines. The core stage is comprised of five major structures: the forward skirt, the liquid oxygen tank, the intertank, the liquid hydrogen tank and the engine section. The core stage also will house the vehicle’s avionics, including flight computers, instrumentation, batteries, power handling, sensors and other electronics. The Boeing Company of Chicago is the prime contractor for the SLS core stage, including its avionics. On the first SLS and Orion mission, known as Exploration Mission 1 or EM-1, SLS will launch an uncrewed Orion to a stable orbit beyond the moon to demonstrate the integrated system performance of the spacecraft and rocket. From the lunar vicinity, Orion will return to Earth to demonstrate re-entry and landing prior to a crewed flight. The hardware being welded at Michoud will include confidence, qualification and flight components of the core stage. Confidence articles verify that weld procedures are working as planned and tooling-to-hardware interfaces are correct. It also gives the weld team experience in bringing all aspects of hardware, tooling and software together. Qualification articles closely replicate flight hardware and processing procedures. Those qualification articles are later structurally tested to ensure the vehicle design is sound. Flight hardware is just that – hardware that will fly as part of the rocket to space. Engineers and technicians at Michoud are using six state-of-the-art welding tools for the core stage, including the world’s largest spacecraft welding tool, the Vertical Assembly Center. At 170 feet tall, the Vertical Assembly Center is the last stop in welding the primary structure and is used to join domes, rings and barrels to make a completed section of the core stage. Qualification hardware for the liquid oxygen tank, the intertank, the liquid hydrogen tank and the engine section will be shipped on the Pegasus barge for structural loads testing at the Marshall Center. Two new test stands are being built that will subject the liquid oxygen and liquid hydrogen tanks to loads and stresses, which ensures that the structure’s design will handle flight environments. The tests also will verify the models already in place that predict the amount of loads the core stage can withstand during launch and ascent. The initial SLS configuration will have a minimum 70-metric-ton (77-ton) lift capability and be powered by twin boosters and four RS-25 engines. The next planned upgrade of SLS, known as Block 1B, will use a more powerful exploration upper stage for more ambitious missions with a 105-metric-ton (115-ton) lift capacity. In each configuration, SLS will continue to use the same core stage and four RS-25 engines.